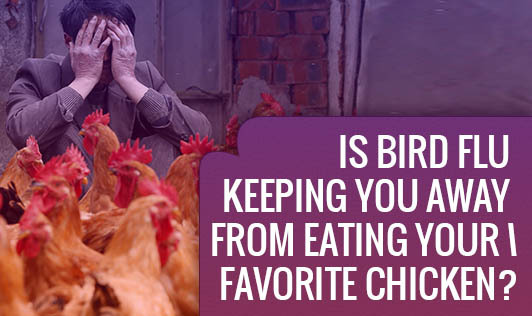 Is Bird Flu keeping you away from eating your Favorite Chicken? Bird flu fear is back in the news with millions of us staying away from our favorite chicken dish because of this deadly virus. Read through to get an understanding of what the flu is all about. Bird flu, or avian influenza, is a viral infection spread from bird to bird. H5N1, a deadly strain of bird flu is a highly pathogenic virus to most of the birds and also a concern for humans. Fortunately, H5N1 unlike any other human virus doesn't get transmitted from human-to-human unless they are in exceptionally close contact! Reports say that slightly more than 60% of those who were infected by H5N1 have died. Farmers and others who work at poultry farms, travelers visiting affected countries and people who come in contact with infected birds or who eat uncooked poultry meat, eggs, or blood from infected birds are at high risk of contracting bird flu. Infections can spread through touching contaminated surfaces and also the virus can be present in infected bird's feces and saliva for as long as 10 days. Dry or productive cough, diarrhea, difficulty in breathing, high fever, headache, muscle ache, sore throat and running nose are a few symptoms. Abnormal breath sounds, a chest X-ray, nasopharyngeal culture, white blood cell differential count and a routine kidney, liver and heart function tests can be used as a diagnostic tool for bird flu infection. Bird flu is treated symptomatically. Infected patients can be isolated while under treatment to avoid an outbreak. The U.S. food and Drug Administration has also come up with a vaccination for bird flu to prevent the outbreak of bird flu. Bird flu, if severe can manifest itself as acute respiratory distress, pneumonia or sepsis if left untreated. Hygiene plays a very important role in keeping bird flu at bay. So be sure of where you eat your favorite chicken or egg from, as under cooked poultry products can up your chances of catching bird flu!